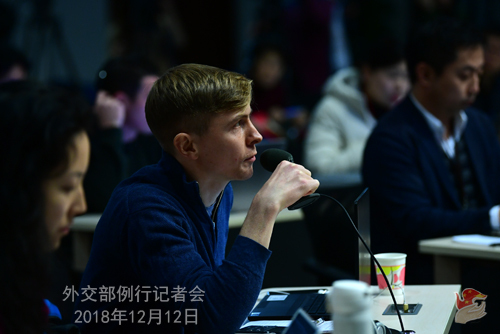 Q: A former Canadian diplomat Michael Kovrig has been detained in Beijing. Could you comment on whether this is a retaliation for the detention of Huawei CFO Meng Wanzhou? What are the charges against him and also could you respond to the criticism that this is some form of kidnapping or hostage in the negotiations with the United States? A: Your questions fall into two parts. On the case of Ms. Meng Wanzhou, we made clear our position to the Canadian side, the US side, and on this stage as well. That is the Canadian government shall immediately release Ms. Meng Wanzhou and ensure her lawful and legitimate rights and interests. You also asked about a Canadian national being detained in Beijing. I have no information to offer. But I can assure you that if such a story was true, the Chinese authority will deal with the matter in accordance with laws and regulations. Q: Have Canadian consular officials been provided access to Michael Kovrig? A: Like I said, I have no information to offer on that. Generally speaking, China and Canada maintain normal communications on consular affairs. Q: The International Crisis Group's statement indicates that the Ministry of State Security detained Michael Kovrig. Does that indicate that the charges likely brought forth against him are espionage-related? If not, why was he detained by the Ministry of State Security rather than the Ministry of Public Security? A: First of all, on this case that has been reported by the media, I have no information to offer. Besides, if the ICG claims that this person was conducting activities on its behalf in China, then I need to remind you, or maybe through you to remind this group, that as far as I know, the ICG has not legally registered or submitted documents for the record in the mainland of China. Then its staff carrying out activities in the mainland of China violates the Law of the People's Republic of China on Administration of Activities of Overseas Nongovernmental Organizations in the Mainland of China. Q: Are you saying that the ICG has not registered in China as an NGO? A: I have made my point clear. It has not registered in the mainland of China as required by law, nor has it submitted documents for the record. Q: To my understanding, Michael Kovrig was based in Hong Kong not Beijing. What is your comment? A: This needs to be clarified by the ICG itself. As for Michael Kovrig, like I said, I have no information to offer on that. As for the ICG, I must make it clear that it has not registered or submitted documents for the record in the mainland of China as required by law. So, its relevant activities in the mainland constitutes violation of the Chinese law. Q: Can you explain what the relevant activities mean and has he been given access to a lawyer? A: You can check on these facts. China adopted in 2016 the Law of the People's Republic of China on Administration of Activities of Overseas Nongovernmental Organizations in the Mainland of China, and amended it in 2017. Overseas NGOs need to go through a set of provisions and procedures in accordance with laws and regulations to legally organize activities in the mainland of China. Q: There are lots of international organizations and companies that do not have offices in China, but their employees do come to China on a regular basis. Are you saying anyone in that situation could be in violation of Chinese law? A: You cannot distort what I just said. As clearly stipulated in the Law, an overseas NGO has a set of provisions and procedures to go through to get registered and submit documents for the record if it wants to carry out activities in the mainland. Q: According to my understanding on the NGO law, there would be 10- or 15-days maximum detention. Does that mean after 10 or 15 days, Michael Kovrig would be released? A: You are presupposing something here. I have said that I have no information to offer on this matter here. Q: The Chinese Foreign Ministry has warned Canada that there would be serious consequences if Ms. Meng was not released immediately. Should we understand the detention of Mr. Kovrig as an expression of these serious consequences? A: I have no information to offer regarding Mr. Michael Kovrig. As for the serious consequences we are talking about, they are wholly dependent on the Canadian side. Q: I want to clarify one thing. Does this mean that he was not here on holiday or something, but was working for his organization? Is this what has been found in breach of Chinese law? A: Like I just said, I have no information to offer on the situation of Michael Kovrig. Q: Some people say that the arrest of the former Canadian diplomat is to protect Meng Wanzhou. Do you agree with that? A: I don't get your logic. Like I said, if the arrest does happen, the Chinese authority will deal with the case in accordance with laws and regulations. Q: On the part of other NGOs or think tanks, if they send their staff here to China to attend a conference or do the kind of routine activities, should they worry that China is not a safe place for them right now? A: There are clear stipulations in the law. China is an open country, and we maintain normal exchanges with all other countries. We welcome a lot of tourists every year. They don't seem to have anything to worry about. Foreigners in China, as long as they observe Chinese laws and regulations, have nothing to worry about. Q: China has called for the immediate release of Ms. Meng. She was in fact released on bail. Does that satisfy the Chinese demands? A: Our attitude on this case is very clear. The Canadian side should correct its mistakes and release Ms. Meng Wanzhou immediately. Q: President Trump in an interview with Reuters yesterday said that Meng Wanzhou's status could be seen as a part of the trade negotiations moving forward between China and the US. He will be willing to consider intervening with the Department of Justice if it could help with the deal. So, that could essentially make Meng Wanzhou a part of the negotiations. What is your comment on that? A: Besides lodging stern representations with the Canadian side, we also did that with the US side. The US government is pretty clear with our position on this issue. Q: The Canadian Prime Minister and Foreign Minister have expressed their concerns over the Michael Kovrig case. Has the Chinese side received representations from the Canadian side? A: Regarding what's described in the media reports, I have no information to offer. Like I said, generally speaking, China and Canada maintain normal communications on consular affairs. 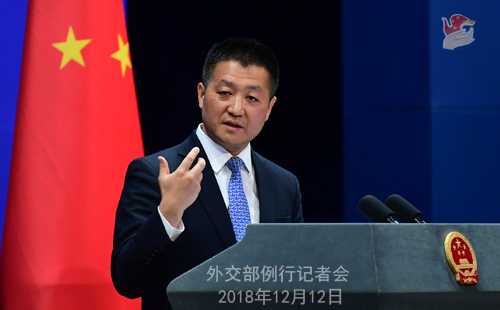 Q: China has criticized Canada for not providing proper notification of the detention of Ms. Meng Wanzhou and for breaching the consular agreement between the two countries. I understand that the Canadian officials here have not received consular access to Michael Kovrig. Does that put China in violation of its consular commitments to Canada? A: I may repeat that I have no information to offer regarding this matter. China and Canada are obliged to strictly abide by the consular agreement. Q: For someone who works for a foreign NGO based in Hong Kong and then comes to visit Beijing, what kind of visa does he/she need to have? A: It depends on his/her purpose of visit. Q: President Trump also said that there would be upcoming visits scheduled between the US and China when it comes to trade negotiations. Can you confirm any scheduled visits? Can you confirm if China has already resumed purchasing US soybeans? If so, to what scale? A: We have said that part of the consensuses reached by the two leaders in Buenos Aires is that the economic teams of the two sides should intensify efforts for consultations to resolve differences in the economic and trade fields and reach a solution acceptable to the two sides. As far I know, the working teams on the two sides are stepping up consultations. We hope that the two sides could work together to create favorable atmosphere and conditions for achieving a good outcome. 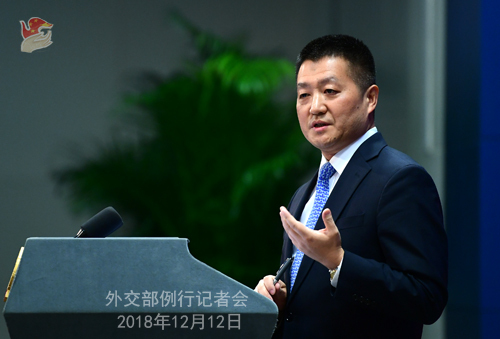 The Commerce Ministry two days ago released a statement on the phone conversation between Vice Premier Liu He and US Treasury Secretary Mnuchin and Trade Representative Lighthizer during which they formulated a roadmap and timetable on next-step consultations. As for the details, I would still refer you to the Commerce Ministry. Q: What is the connection between the detention of Michael Kovrig and the bail of Meng Wanzhou in Canada? A: On the Meng Wanzhou case, our attitude is very clear. We ask the Canadian side to correct mistakes and release Meng Wanzhou immediately. Relating to Michael Kovrig, I have no information to offer. Q: According to your explanation, the ICG has not registered. Following this logic, do other employees of the ICG in China face the same risks? A: It all depends on their purpose of visit in China. China receives many tourists every year. Such visits carry no risks at all if they are normal travelling. We welcome foreign travelers. But if they engage in activities that clearly violate Chinese laws and regulations, then it is totally another story. Q: President Trump also said in that interview that Huawei might be part of the negotiations. Is China expecting that to be the case? Will China trade on this? A: Ms. Meng Wanzhou's arrest is a mistake from the start. We have made clear our position to the Canadian and US governments that they should immediately correct their mistakes and release Ms. Meng Wanzhou. Q: Has Michael Kovrig been charged yet with anything? A: Like I said, I have no information to offer. Q: Does China welcome President Trump's proposed involvement in the Meng Wanzhou case? A: The US side is very clear with China's position on the Meng Wanzhou case. We welcome any efforts to move the case toward a correct resolution, whether such efforts come from the US leadership or senior officials. Q: From China's point of view, is the ICG registered in China? A: I have said that the ICG has not registered or submitted documents for the record in the mainland of China as required by law.